Amber & Co is the leading independent and highly respected local estate agent in Shepherds Bush, W12. With 20 years’ experience in the business, our mission is to provide a friendly and efficient service to all of our clients. We at Amber & Co believe good, honest communication is the key to having a successful relationship with your estate agents. We are living proof that local knowledge and understanding of the community is far more important than anything else. You, the vendors, landlords, purchasers and tenants are our main priority. We are proud to be members of The Property Ombudsman (TPO), the National Association of Estate Agents (NAEA) and The Tenancy Deposit Scheme (TDS). These professional bodies are the industry watchdogs and regulators who actively promote the highest standards of customer service in our industry. We offer our clients the most professional and comprehensive service coupled with highly competitive rates. We are continuously training to the highest standards and offer a comprehensive service tailored to the wide ranging needs of the vendors, landlords, purchasers and tenants. We are able to offer a unique level of skill, specialization and unrivalled level of customer service. This expertise helps to ensure that we can match a vendor to a purchaser to a property, landlord to a tenant and a tenant to a property. 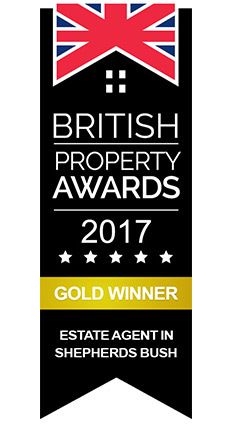 We are voted the best estate agent in Shepherds Bush this year and aim to continue to offer our bespoke, good, honest and quality property experience to all our clients. We believe that the depth of our local knowledge in both sales and lettings is unique in the area.